Classic details are intertwined with modern conveniences to create a new breed of traditional office suites. 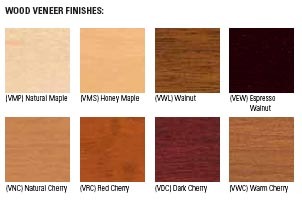 Exquisite in details, Yorkshire combines wood veneer construction, a 1 1/2" thick traditional beveled edge design, a choice of eight warm woodgrain finishes and a diverse array of technological innovations. Modern conveniences include articulating keyboard drawers, retractable power bars and electrical power/data boxes. All drawers feature a choice of two handle options - Oxide Brass or Antique Brass designs. Cabinet and hutch doors coordinate with a matching round knob handle design. Versatile and stylish storage units include hutches, bookcases and personal towers, to name a few. Center Storage Tower Hutches are as stylish as they are functional, featuring open storage shelves perfect for important documents or personal items. 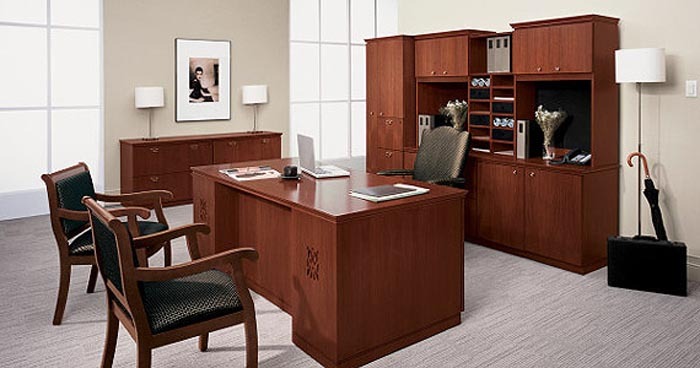 From reception to Boardroom, Yorkshire effortlessly adds classic styling to your entire office environment. Choice of two handle options - Oxide Brass or Antique Brass. Cabinet/hutch doors feature a round knob in a coordinating brass finish. Desks and credenzas feature pedestal construction with a recessed modesty panel. Desks feature a decorative motif on pedestal back panels. Delta and Radius End Extended Corners and Islands create innovative ways to increase worksurface space while enhancing design. Layout of top image. Total List Price of Desk Unit $15,150. Credenza List Price $4,150. Desks feature pedestal and panel construction with a recessed arched modesty panel and decorative motif cut-in on pedestal back panel. Storage Tower Hutch provides closed door storage with open shelving and stationary organizer. Cabinet doors feature knob handles in a brass finish.